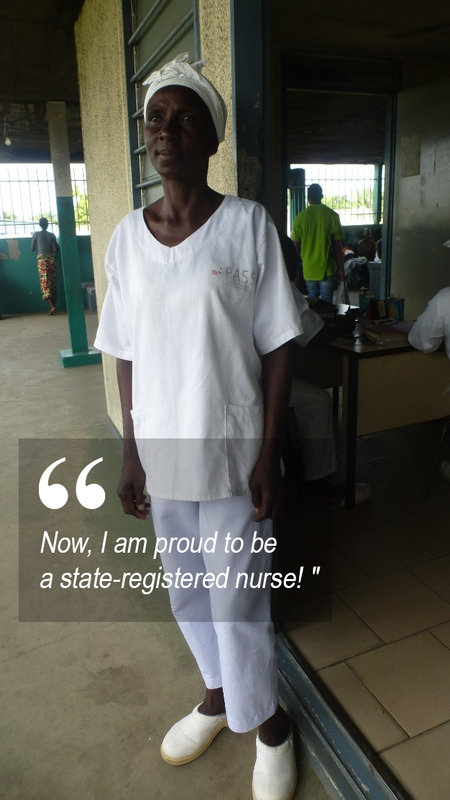 State-registered nurse at the CSI Madeleine Mouissou in Pointe-Noire (Congo-Brazzaville). On-going training of healthcare workers. Since 2012, in Pointe-Noire, the IECD has been in charge of a Support for Healthcare Structures Program (PASS) which helps to strengthen the skills of partner healthcare structures through the on-going training of their staff and the renovation of facilities, in way that significantly improves care for vulnerable women and children. Geneviève is a nurse at the Madeleine Mouissou healthcare center in Pointe-Noire. She has followed the training courses offered by PASS. “The PASS training courses have changed me. I have learned a great deal and I continue to learn every day. Before, I used to shake with fear because I didn’t feel comfortable about administering drugs and I was embarrassed about it. Now, I have no problem calculating doses, regardless of the product. I have greatly improved my professional practices and I realize that I have also made progress in my personal skills with patients and their loved ones. We work a great deal as a team, we are united and when there is a mistake it is not the fault of one person but of the entire team! Look at my working clothes! Thanks to PASS I understand the importance of wearing a clean uniform.